Instead, the professional development literature is full of complicated recipes for executive presence (2 parts gravitas (which has so many subparts I stopped counting), 1 part communication (ditto) and a dash of “professional appearance", reads one). Another says “your ability to project mature self-confidence, a sense that you can take control of difficult, unpredictable situations; make tough decisions in a timely way and hold your own with other talented and strong-willed” people. Beeson, John. “Deconstructing Executive Presence.” Harvard Business Review, 29 June 2017. But for today’s purpose, let’s just focus on one piece of executive presence that you can absolutely tackle today — no orange creams involved. It’s easy: set an intention for your interactions. Do that and you are more likely to be able to project that self-confidence and sense you can take control of tough situations, engender confidence from others that you can make tough decisions, and hold your own. Basically, set an intention for your interactions and you can improve your executive presence. Let me explain what I mean. When you look at your calendar the afternoon before (because you do, right?) and evaluate what you have the next day, decide how you want to show up in that interaction. As you do this, it can be helpful to apply Erving Goffman’s front stage/backstage approach (explained in The Presentation of Self in Everyday Life). Basically, the theory goes, every one of us is acting in some sense. Think of an actor in the wings reviewing her lines and fidgeting nervously who then lifts her head, pastes on a smile, and marches on stage confidently. When we’re front stage, we are trying to manage how others view us. Backstage, though, is where we aren’t worried about impressions and are focused on doing the work. Applying the front stage/backstage concept to the way you structure your time can be helpful in managing your energy and your attention. If, for example, you normally spend 4.5 days each week backstage in your office, head down, focused on doing work, interacting with others only when waiting for the microwave, it might be helpful (and important) to start adding some frontstage time. If, on the other hand, you find yourself running from meeting to meeting, wasting the downtime in between, and wiped out by Thursday because you’re tired of smiling, talking, and sitting up straight, you might want to start trying to cluster your meetings so you have more concentrated offstage time to both focus on execution and to give yourself space to think. You can take this concept a step further by setting an intention for each of your front stage interactions. So, for example, maybe your intention for a call with a client who is in a panic about a situation is to help the client vent and express their panic and frustration, take in the facts, probe to learn additional facts, brainstorm next steps, and make sure the client acts in a way now such that they don’t overreact, and don’t do anything until you can figure out what’s next. In that case, you want the client to end the call feeling heard, and that they’re in good hands. As you prepare for that call, whether you have 15 minutes or a day, you might decide that for this “front stage” item on your calendar, you need to show up as calm, knowledgeable (or at least not unknowledgeable), and responsive. If you normally start your calls with this particular client talking about sports or the weather, maybe you leave that part out for this call because you want to convey that you understand the gravity of the situation. For an internal meeting about the client’s call, you’re still front stage, but it may be less formal than in talking with the clients. In that conversation, you may want to get put in charge of addressing the client’s concern, in which case you may want to clearly and fully convey the potentially relevant facts from the client without overdramatizing, make clear that you are interested in the assignment and have enough slack in your schedule to take it on, and are ready to lead. The front stage/backstage analysis can be helpful in avoiding inadvertently becoming too comfortable in a situation and acting in an overly familiar way. If you’re having coffee with a former classmate, the interaction probably isn’t truly offstage time, because you want to represent yourself and your employer as a professional, not share any confidential information, and be mindful of the fact that you may be friendly, but not friends, so it is a professional meeting rather than a social call. Drafting and reviewing research, for example, are probably truly offstage time. If you’re in your office working, as long as you aren’t wandering around in socks or talking to yourself with the door open, you can probably just focus on the work at hand. Finally, your intention for dinner with a potential hire would definitely fall into the onstage category, but here again it can be important to be mindful about showing up as professional but also approachable, and authentic as you conveyed the positives and minuses about the employer while gathering information to evaluate the candidate. If all of this seems like too much work, let me assure you that spending a minute or two to think “is this front stage or backstage? and how do I want to show up in this interaction?” is much more efficient than spending time trying to make up for a bad impression made carelessly. As you start to look ahead to your calendar and think about how you want to show up, congratulate yourself on taking this step to be more intentional about how you want to show up in interactions. 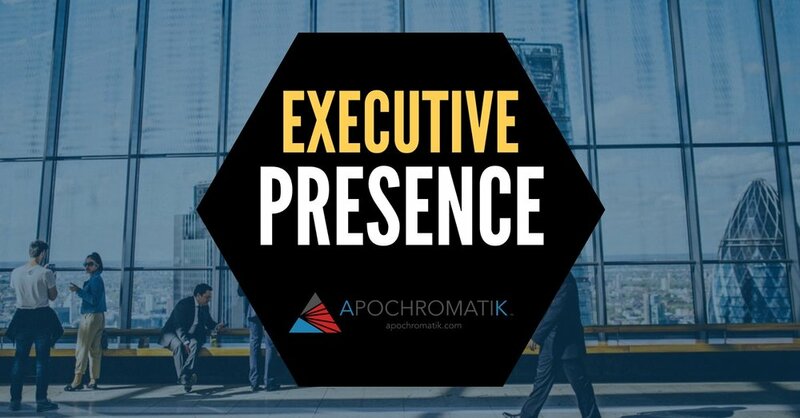 Your executive presence will improve, and with it, your confidence and career. If you’d like to do a deeper dive into improving your executive presence, The Power of Presence: Unlock Your Potential to Influence and Engage Others by Kristi Hedges is a great resource. We also work one-on-one with clients who want to develop their executive presence, whether as their primary goal or as part of a larger career improvement plan. And we offer workshops, ranging from one hour to half a day, where we help teams and organizations improve their emerging leaders’ executive presence. Email amy@apochromatik.com for information.